Home » Horse Lying Down On Side – Is There Anything Wrong? Horse Lying Down On Side – Is There Anything Wrong? One day, you walk out and see your horse lying down on side. Why is my horse lying down? Is it bad for horses to lay down? And, can horses die if they lay down? Don’t worry too much, they are just sleeping. 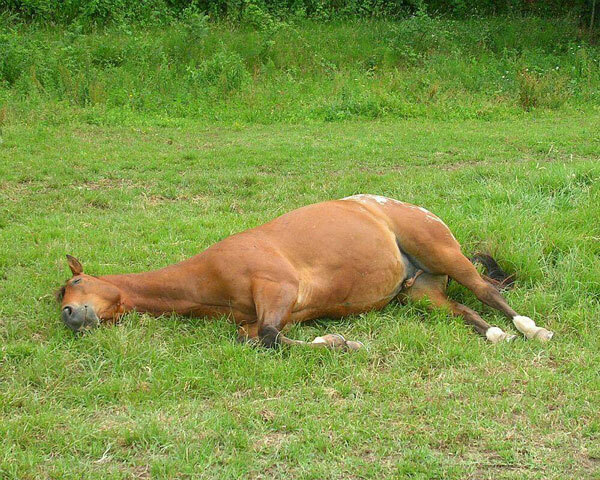 Lying down is a part of the horse’s sleeping behavior. As you know, sleeping is an essential part of all living creatures, when sleeping, energy is fulfilled and get ready when waking up. You might be still wondering about this sleeping behavior in horses. Get go through this articles, it might help you to understand more about horse lying down on a side. Is it okay for horses when lying down like this? Can horses die if they lay down? Are horses lying down on side OKAY? How long does a horse lay down to sleep? Sleep is an essential part of living. Good sleep will affect and also improve your mental and physical health in many ways. We usually spend hours to lie down and take a rest, the number of hours will be seven to eight hours, these numbers are ideal with mature people. While sleeping, their will cycle of 1, 2, 3, 4, and REM (rapid eye movement) sleep every 90 to 110 minutes or so, it will go through your sleeping until you wake up. As for horses, they may spend about 4 to 15 hours per day in standing to take a rest anywhere. However, only a few minutes that they really fall asleep and take short naps. At these times, you will see a horse lying down on a side. The total of sleeping time of horses could last from a couple of minutes to a few hours a day. The average time of sleeping for adult horses is about three hours per day. As for young horses, they are tending to sleep much more than mature horses. And for senior horses, they will take short sleep more often. Besides the age of horse, the length and type of their sleep are affected by nutrition, temperature, workload, pregnancy, and gender. The period of each sleep phase is very short, it only lasts a few minutes at a time. Sometimes, horses laying down might be not a good sign, especially when you see a horse lying down more than usual. They might be suffering sick, almost is colic. What is colic? Colic is a general term for belly pain in a horse. There are many reasons to cause colic in horses. Here are some common reasons: Gas, impaction, sand, or stones, or unknown reasons. No matter the reasons are, many of the signs that you will see are the same. It is truly difficult to identify which is medical colic, or surgical colic by only looking. Colic in horses is a very common ailment but it could be very serious. Never underestimate this! Fortunately, most colic in horses could be resolved with minimal medical treatment. With more serious cases, your horses might need help from surgical intervention. As I said above, the signs are the same and it’s difficult to identify. However, you could do some small examination to check on your horse’s situation. Take the temperature, heartbeat, and breathing. Check the horse’s temperature. Normal temperature in a horse is approximately 100.5 F (38 C). If it gets over 102 F (39 C), it can indicate that the horse has an infection or not. Check the heart rate. This can be checked by placing your hand under the left elbow. Count the beats for 10 seconds then multiply the beats by 6. That will tell you the heart rate per minute. A normal heart rate is 35-40 beats per minute with the horse. A healthy horse should take between 8-12 breaths per minute and its pulse should be between 36 and 42 beats per minute. If a horse eats freshly mowed grass, it can get colic. If you suspect this, make sure that your horse is treated right away. If your horse has a runny nose, it could be due to allergies or they are just sweating. Write down how your horse eats in the last few days. It is good if you could list in details of what they ate, how many meals a day, did they eat a lot or not. The water that your horse drinks is still the same? Is there anything different? Check horse’s gum. Does it have normal color as usual? Dark red or purple is not good. Some horses lie down but not rolling, just lie quietly but they are suffering colic. If the horse tries to lie down again and again in the next 5 to 10 minutes, or you notice any other of the signs of belly pain, the worst thing is they couldn’t get up. It’s time to pick up your phone and contact your vet immediately with your examination results and what are you worry about your horse. Oh my, he looks not good at all. Call him a vet now! Finally, I would like to sum up what we have gone through together. Do not worry too much if this is the first time you see a horse lying down on a side. In the next minutes, if you see a horse still walk around, it means that he/she has just taken a nap and you better not to bother with it. However, if you see some strange things just likes horse lying down more than usual, better to check the temperature, heartbeat and watch them carefully. It these signs keep occurring, don’t hesitate to contact your vet to have an in time cure. Remember these things and your horse will be thankful to you as you are a good owner with great knowledge. Next time, don’t be panic to see a horse lying down on a side. He/she is just simply taking a rest. I think that it would be good to show your politeness by not waking it up.